The authors emphasize the concept of countering ISIL in the narrative space in synchronization with combat operations. 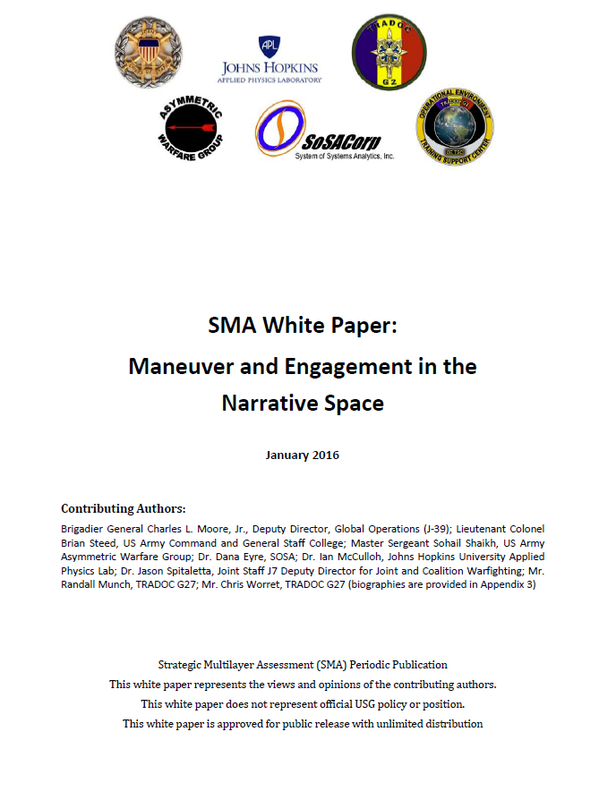 While maneuver and engagement in the narrative space could be conducted independently of combat operations, conducting maneuver and engagement in the narrative space in support of combat operations is more likely to achieve lasting effects in the human domain. These ideas reflect a new view of what is required to succeed in future conflict because of the growing realization that decisive effects are often achieved in the narrative space. Thousands of airstrikes helped to check their [ISIL’s] rapid expansion, but the decisive effort against them will require discrediting their narrative and connecting the people to legitimate governing structures – areas where Department of Defense should not have primacy. Discrediting ISIL’s narrative will require a long-term effort by a team of experts. It will require: (1) developing an in-depth understanding of ISIL’s narratives and why they resonate with target audiences, (2) building a whole of government team that can effectively counter and replace ISIL narratives with a strategic communications plan that directly supports our desired end states, (3) globally employing counter-narratives and replacement narratives, (5) gathering and collecting data to assess the effects of narratives (theirs and ours), and (6) continually refining the content and employment of our narratives based on an assessment of their effectiveness. An effective, whole of government, Strategic Communications plan requires close coordination and synchronization across all lines of effort. The US Department of State should lead the US effort with support from the other Departments/Agencies on behalf of the US government. To be successful, our approach must also include our friends and allies. Specific multinational partners can help us understand why some ISIL narratives resonate and how they can be countered and/or replaced. In fact, truly effective influence operations require a combination of art and science. The best approach will most likely require contributions from neuroscientists, sociologists, psychological operations specialists, intelligence analysts, civil affairs planners, law enforcement professionals, and others. The melding of these diverse inputs into a comprehensive strategy demands skill, patience, close coordination and an inherent understanding of the ultimate end states. Ultimately, discrediting ISIL’s narrative will most likely take years and will require significant resources. However, the execution of our strategic communication game plan, from initial analysis to our measure of effectiveness, must be conducted with the speed and agility necessary to not only replace ISIL’s narrative but to drive and shape their perceptions and subsequent actions. Simply put, to achieve victory we must outmaneuver and outpace ISIL in the narrative space. Currently, the opposite is occurring and is a trend that must be reversed.